NASA bravedbelow-freezing temperatures in Florida Wednesday to move the space shuttleEndeavour to its seaside launch pad for a planned Feb. 7 blast off to theInternational Space Station. Endeavouris due to launch from Pad 39A at the Kennedy Space Center in Cape Canaveral at 4:39 a.m. EST (0939 GMT) on Sunday, Feb. 7 on the first of NASA?s fivefinalshuttle missions before the three-orbiter fleet is slated to retire thisfall. The predawn liftoff is expected to be the last nightlaunch of a NASA space shuttle. A coldfront passing over central Florida forced NASA to make extra preparations fortoday?s launch pad trek to combat the bone-chilling weather. ?We?re notreally worried so much about the hardware, we?re worried about the software -the people,? NASA spokesperson Allard Beutel told SPACE.com. ?Nobody will beoutside along the way for more than a half hour.? 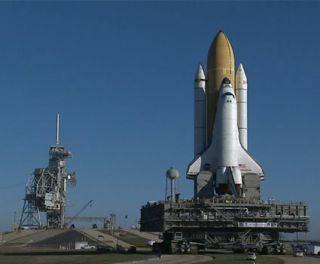 NASA?s safetyrules for shuttle launches prohibit liftoff attempts during extremely coldweather below 36 degrees Fahrenheit (2 degrees Celsius), but chilly weatheralone is not enough to delay a space shuttle?s trip to the launch pad, Beutelsaid. Today?s shuttle move began at 4:13 a.m. EST (0913 GMT). ?Certainparts of the orbiter have to be kept warm at a certain temperature, but that?spart of our standard operations anyway,? Beutel said. NASA wasmore concerned for its shuttle engineers and technicians accompanying theorbiter on its 3.4-mile (5.4-km) trek to the launch pad, a journey that tookabout six hours. Dozens oftechnicians accompany the a shuttle to the launch pad, many stationed insidethe massive Apollo-era crawler carrier vehicle that hauls the combined 12million-pound (5.4 million-kg) load of Endeavour and itself to the launch pad.Instead of spending the entire time walking alongside the shuttle or standingatop the crawler carrier?s deck, the workers rotated out every 30 minutes towarm up inside nearby vans or other vehicles, Beutel said. Endeavour?sSTS-130 mission will mark NASA?s firstshuttle flight of 2010 and will deliver a brand-new connecting module,called Tranquility, to the International Space Station. The shuttle is alsocarrying a new observation deck called the Cupola, which will be attached toTranquility to provide a seven-window vista of the station?s exterior and Earthbelow. Three spacewalks are planned for the mission. TheTranquility node and the Cupola will be delivered to Endeavour at the launchpad next week, Beutel said. Endeavourcommander George Zamka and his crew are expected to arrive at the Kennedy SpaceCenter spaceport on Jan. 19 to begin several days of final training and a launchdress rehearsal. Top NASA shuttle officials plan to meet Jan. 27 in a standardreview to determine if Endeavour is ready to launch next month. ?Thatshould put us on target to be able to support a Feb. 7 liftoff,? Beutel said,adding that shuttle workers currently have a full week of buffer time to handleany unexpected glitches with launch preparations.